Posted by Eddie & filed under Military/Aircraft, Mountains & hills, May 6 2009. 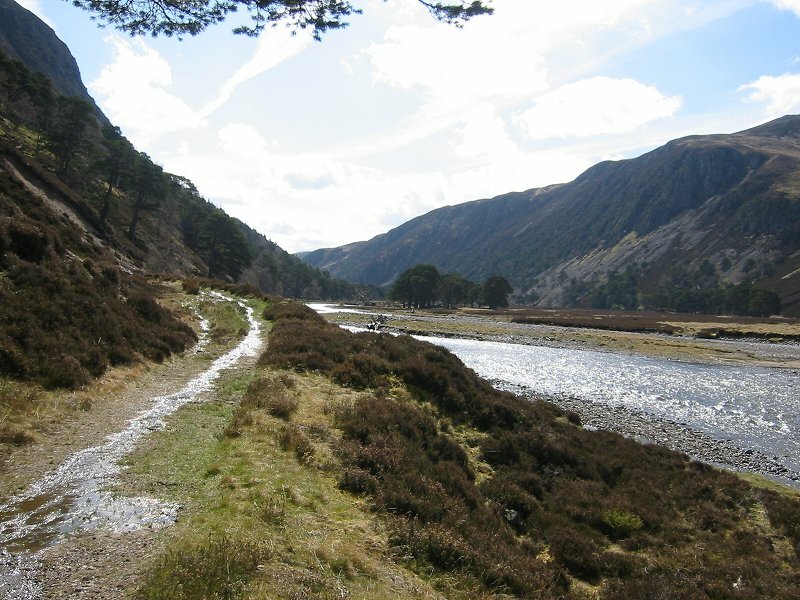 Last weekend I was walking in the northern Trossachs near Balquhidder. I walked up to a 771m Corbett summit, Beinn Stacath. 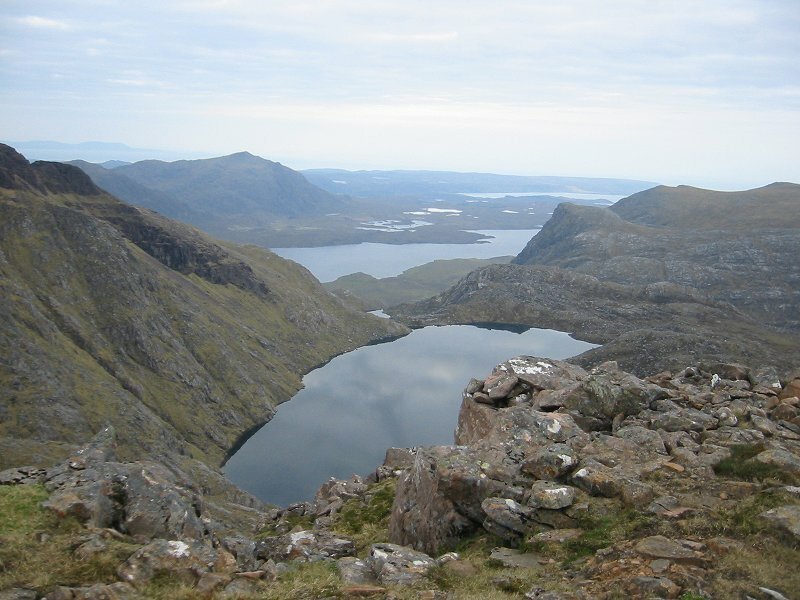 This hill is unnamed on the OS 1:50000 map, but has in the past been referred to as Stob Fear-tomhais and Ceann na Baintighearna and it now seems that Beinn Stacath is the agreed name. The weather was cold and windy, and there were several showers of rain throughout the walk which was falling as snow on the nearby summits of Stob Binnein and Ben More. It’s still winter at the moment in the Highlands, and the weather at the moment is nowhere near as good as it was this time last year when I climbed summits in Letterewe and Ben Wyvis, and went cycling in Glen Feshie. I saw a lot of animals on this walk, both wild and domestic. There was a lot of cows with newly-born calves, a lot of sheep with newly-born lambs (I saw one that must have been born only moments earlier), and I saw some deer and also a red squirrel by the road near to the start of the walk (only my third sighting of one). I had to skirt around the domestic animals to give them a wide berth so the route took me over some marshy ground, and with the rain as well I was pretty soaked by the end of the day. 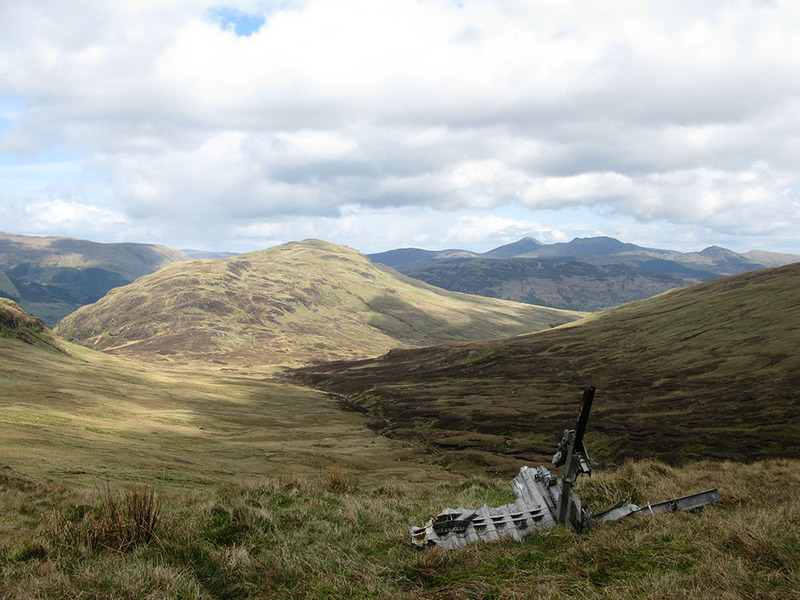 Near the summit of Beinn Stacath is wreckage from an RAF Armstrong Whitworth Whitley that crashed in 1941. There are some scattered remains at the site, mostly unidentifiable mangled pieces of metal, but some clearly undercarriage parts. 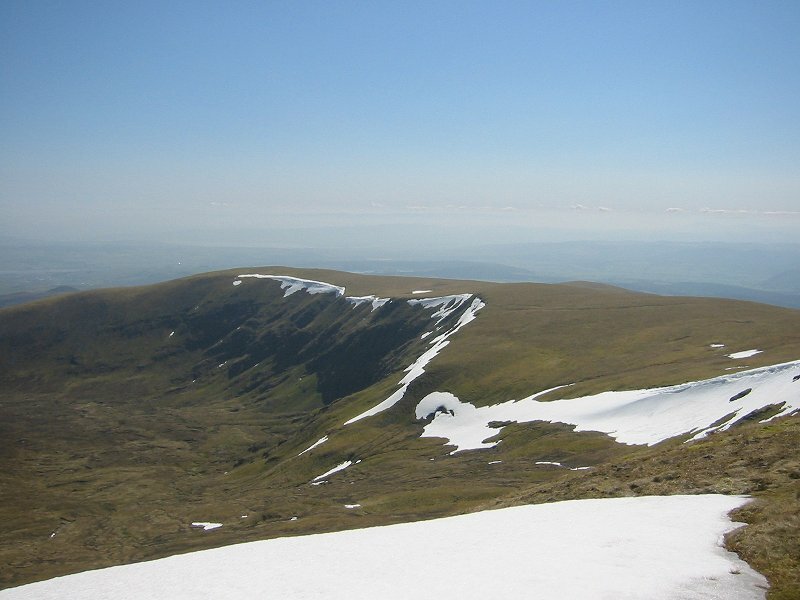 There is a noticeable scar on the hillside where the aircraft impacted the mountain, and wreckage is scattered from this point downwards to the Allt Fathan Glinne below. 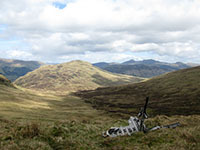 This site used to be one of the most well-known wreck sites in the Scottish Highlands – large and intact pieces of the aircraft were highly visible until 1980, when the site was largely cleared. You can see photos of the wreck site on my website here. You can see the photos from the rest of the walk on my website here. Crossed Calair burn on way up and feet just stayed dry. On way down found a large piece of wreckage in burn (Allt Fathan Glinne) at about NN500178 – perhaps moved from original site by water and wind or humans. Braved the Private Deer Park without mishap. my son and I visited the site crash site approximately 25 to 30 years ago . In those pre GPS days we cast about above the site for a few minutes before seeing it. If the site was cleared in 1980 our visit must have been well after the clearance but substantial pieces remained as I recollect .We poked about and suddenly I uncovered an RAF hat badge , although you are not supposed to remove any thing we could not bring ourselves to replace it despite feeling a bit guilty. The aircraft apparently was on anti submarine patrol from RAF Donibristle so how it ended up on this hillside is something to think about , probably a combination of bad weather and navigation error, far too common in that era. For a time i thought Donibristle was Northern Irish sounding and only much later learned it was actually on the Fife coast! Hi John, thanks for your comments about this crash site!